The Physician Insurers Association of America (PIAA), a national organization representing professional liability insurance companies, routinely assesses claims and identifies areas that generate the most frequent or expensive claims. What they found should get our attention – because claims against neurologists had the highest average indemnity and payment ratio. In fact, the average claim payments for neurologists were the highest of all specialties – $289,513 versus an overall average of $183,961 – when evaluating claims closed between 1985 and 2003 by specialty group. Twenty-four companies participating in the Neurology Data Sharing Project reported 300 cases – all were claims in which an indemnity payment was made, all involved patients with a neurologic problem, and 266 involved a neurology defendant. The PIAA and representatives of the AAN Patient Safety Subcommittee designed the data collection instrument that was completed by the member companies. Among their major findings, the encounter most frequently leading to the malpractice claim – in 52 percent of the cases – involved a physician seeing the patient for the first time. The incident occurred in a hospital in 60.3 percent of the cases, followed by the physician's office (36.5 percent). In addition, the primary medical misadventure – an omission or error that contributed to the cause of loss – most often identified in this study was error in diagnosis – in 55.6 percent of all cases and 42.4 percent of claims against individual physician defendants. Conditions included malignant brain tumor, intracranial and intraspinal abscesses, headache, subarachnoid hemorrhage, and fracture of the vertebral column. Thomas H. Glick, MD, Chief of Neurology at the Cambridge Health Alliance, Associate Professor of Neurology at Harvard Medical School in Boston, MA, and a member of the AAN Patient Safety Subcommittee, has studied the PIAA data closely. He believes that they provide an opportunity to learn about higher-risk areas and to consider ways to modify our practice behaviors. “Clearly, the fact that the physician (usually the neurologist) was seeing the patient for the first time in 52 percent of cases means that one of the main positive risk-management factors – a prior patient-doctor relationship – was lacking,” he said. “‘One-shot’ consultations without ongoing communication or follow-up places an extra burden on the neurologist to earn the trust of the patient at the very first contact and establish and maintain a relationship that will promote patient safety and obviate suits.” He recommends that neurologists adhere to the slogan, Once involved, stay involved. Dr. Olson has created an AAN Task Force for Risk Management to discuss ways in which to help members decrease the threat of medical liability. Dr. Glick said the findings relating to “failure to diagnose” can be addressed systemically and through education. Pathways that lead to these failures, he said, include “inadequate examinations (or histories), lack of sufficiently articulated differential diagnoses and recommendations to address the most likely causes, lack of contingency plans in follow-up, as well as problems with ordering, interpreting, or reporting neuro-images or other laboratory tests.” Furthermore, the reports of communication problems among caregivers – representing two-thirds of the complaints – probably contribute to inadequate diagnoses or documentation, he said. Dr. Glick noted, however, that there are limitations to the analysis by PIAA. The cases are all paid claims, he explained, and therefore not representative of all claims; all claims are not representative of errors, nor do all claims signify adverse events, or are they necessarily due to error. Thus, he said, these paid claims provide only a narrow view of the problem of neurologic patient safety in an epidemiologic sense. In addition, the paid claims – by virtue of settlement or jury opinion – may not reflect actual negligence. Finally, he said, since the analysis of the initial data, changes have occurred – such as the dissemination of MRI technology – that may have been affecting – and will continue to affect – these types of problems and solutions in the field of patient safety. This analysis will undoubtedly disturb many of us in clinical practice who already wonder just how much more financial stress and emotional challenge we can bear. But it does provide invaluable insight into the genesis of a lawsuit and affords us a rare opportunity for reflection and examination. For some, this may mean concentrating on communication, making certain that we acquire relevant and meaningful data during the history and physical examination. For others, it may mean focusing on open, clear, and appropriate exchange of information among all those involved in a case, including family, other involved physicians, imaging facilities, laboratories, and hospitals. This requires assessment of medical literacy, with education of patients and families appropriate to that level. For all of us, it means a commitment to ensuring complete, accurate, and legible medical records, and sharing copies of these notes, as well as lab and imaging results, with other medical providers involved in the case. It also means taking the time to make phone calls – even conference calls – with other providers when necessary. WHAT DO YOU THINK ABOUT THE CLAIMS DATA? Do you have suggestions or response to the analysis of claims data on neurology? In what areas can neurologists improve? Feel free to write – 400 words, maximum – Neurotoday@LWW.com. 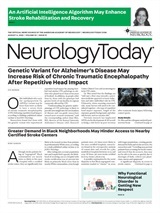 Space-permitting, we'll publish your response in the next Neurology Today.